Jointed Phone Box. This phone box is made of board stock and measures 5 feet tall. It is only printed on 1 side. 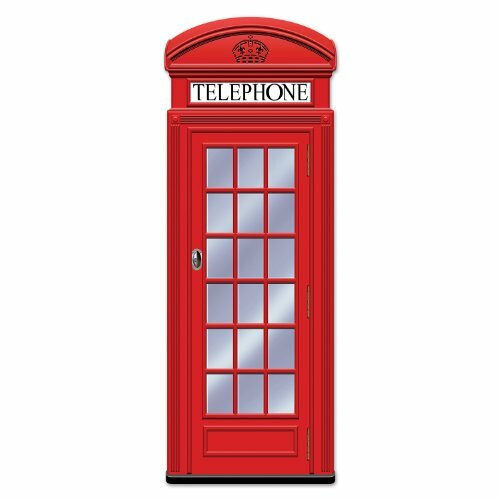 Hang up this jointed phone box at a British or International themed party. Beistle 55516 British Cutouts, 4 per package. These British cutouts are everything you'd see if you went on holiday to England. 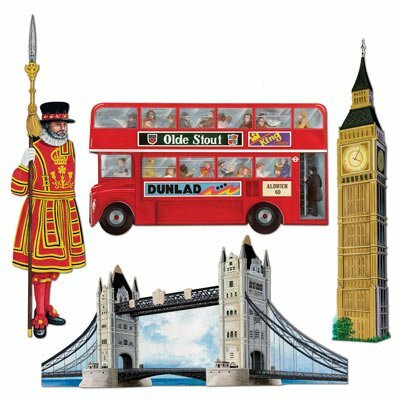 Bring a bit of London to your international party with these fun cutouts. If you are going to have a photo booth, then having the best photo booth props is a must. 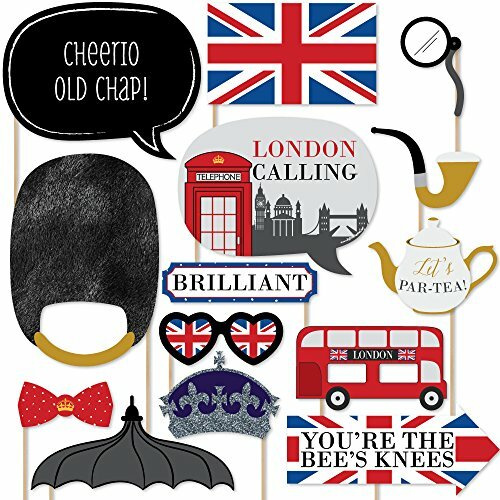 Our London - British photo prop cutouts will help you easily create fun party photos at your party. The photo booth prop kit comes with 20 pieces and is ready for quick assembly. Simply add the included wooden dowels to each prop, attaching with the included clear stickers, and display alongside a fun photo booth backdrop. Your party guests will enjoy using the fun faces and accessories to liven up your photos! Have a child that watched a little to much Doctor Who? Here's the prefect set up for you! 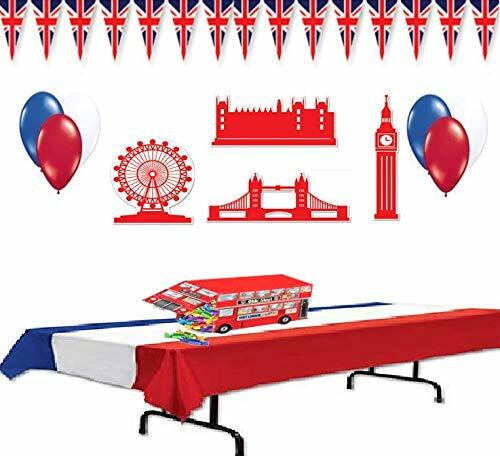 Great for themed parties, birthdays, gatherings, add a splash of color to your party with Union Jack bundle. Ten plastic cups. 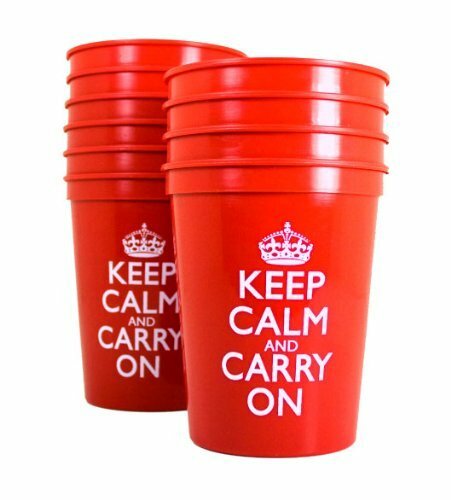 Disposable cups with Keep Calm and Carry On British poster graphic. 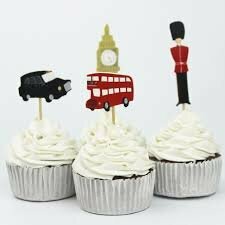 Great party cups and British party decorations. Reusable and dishwasher safe plastic cups that you can use for many occasions. Red cups work for Christmas cups, Valentines Day party cups, Fouth of July party decorations and more. Keep Calm and Carry on is the WWII slogan that motivated the British during hard times. Use these plastic cups for motivational and inspirational tools. 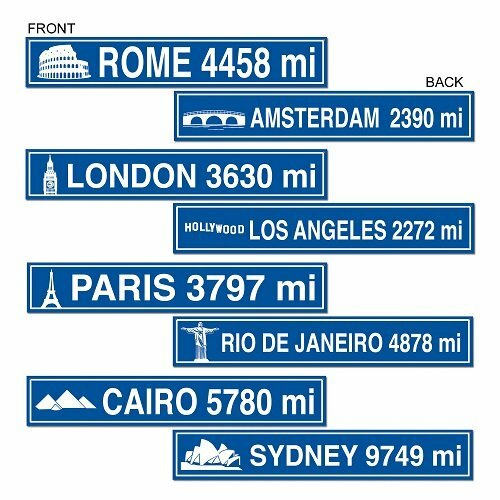 Beistle 54151 Travel Street Sign Cutouts (4 Count) these blue and white street sign cutouts will look great hung up from any wall to direct guests to other parts of the world. 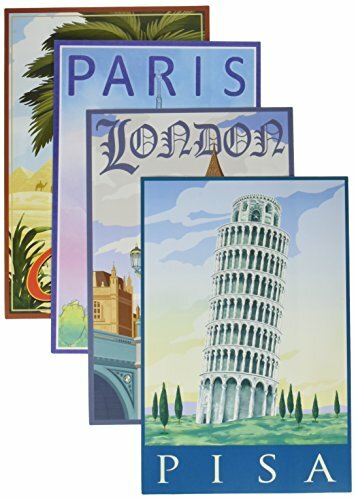 Beistle 54147 International Travel Cutouts (4 Count) are great for foreign language class decorations or even for an international party. These cutouts will make you want to travel. New product Tropical leaves 8" long x 6-1/2" wide, 12 per pkg, coated fabric material If you have any further questions, please feel free to contact us again. We look forward to serving you in the future. - Create an authentic tropical island atmosphere! - These green leaves will add a fresh natural look to your luau decorations! Comes in a pack of 6 leaves. Leaves measure 13" inches. - Looking for Hawaiian party decoration ideas, look no further. - These leaves could also be used for a jungle or rain forest themed event! - 100% Money back manufacturer’s warranty included when purchased from an authorized Super Z Outlet reseller. Make your party unique with these suitcase decorations. You can easily fill your party space when you use these suitcase shaped cut outs for all of your DIY party ideas. Suitcase shaped die-cut decor looks great when used as wall decorations, bunting banners, even styled as centerpieces at your tables. Best of all, this set of World Awaits - Suitcase Decorations DIY Travel Themed Party Essentials, are sure to help you style an impressive party!DIY PARTY SUPPLIES: World Awaits party essentials include 20 large cut outs in one different suitcase shapes that coordinate with the World Awaits party theme. Set of 20 suitcase shapes SIZE measures 7" x 5". The unique design and large size makes these suitcase party decorations an impressive addition to any baby shower, bridal shower or graduation or retirement party.HIGH-QUALITY PARTY SUPPLIES: World Awaits DIY Party essentials are professionally printed on heavy-duty cardstock paper with a photo-like shine. They are individually inspected and carefully packaged by hand. Baby shower, bridal shower, graduation or retirement party essentials will arrive ready to use in all your creative DIY party ideas! MADE IN THE USA: World Awaits - Suitcase Decorations DIY Travel Themed Party Essentials are designed and manufactured at our Wisconsin facility using materials that are Made in the USA. Paw patrol themed party decoration.